USB powered speaker are lousy, right? Wrong! The chilled-out company Arctic Cooling just released a hot pair of stereo speakers that can play anywhere, and they mean anywhere. No sound panel preference settings or software drivers are necessary. Plug the audio cable for this high-performance pair of stylish gray speakers into your audio device, then provide a USB power source and blast off. Stereo separation is terrific. S111 are optimized for laptop and iMac computer playback, with a handy, large, rear-mounted volume control on the right speaker. Sound output is efficient and loud, without distortion at typical listening levels. Make sure your onboard computer volume level is low to medium at first. You can fill a large room or small apartment with clear, full-bodied sound from these little gems. A powered USB port is required from the computer or powered USB hub (not from a keyboard). MyMac recommends you customize your iTunes Equalizer for optimum audio delivery for these and all speakers and headphones. Please ask if you don’t understand how to use your Equalizer, because it make a tremendous difference when you tweak it. Doing a blind speaker test, where the listeners couldn’t see the S111’s small size, our MyMac listening panel gave these speakers a “15 out of 10” for audio quality. Panel members were “amazed these aren’t hundred dollar speakers. Tell your readers the S111 sounds even better from across the room than at close range.” The speakers can be much “turn them down, Nemo!” louder than is comfortable for a conversation, which is a good thing for music aficionados. Be careful with the front face exposed speaker driver cones. They are fully exposed, without any cover protection. Aside from that caution, the physical S111 units are well-manufactured. You’re going to think the following statement is wacko, so brace yourself. With Arctic Cooling’s versatile solar or USB charged Arctic C1 Mobile charger with solar panel, you can power and/or charge an iPod, iPhone, and Arctic’s S111 speakers indoors and outside! Think about it: on the beach, in the yard, at the pool, out camping, anywhere and everywhere, S111 can play from your audio devices via Arctic’s audio cable and C1 charger. The C1 can be recharged via its solar panel or included USB cable. Wowzer. 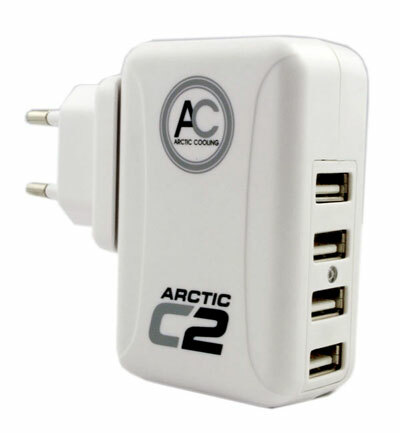 When you need to charge a USB device or several of them, at home or abroad, you’ll be glad to have Arctic Cooling’s C2 Universal Charger for Frequent Travelers, with its four USB ports. 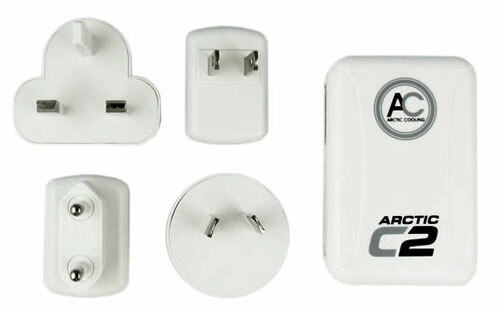 Our MyMac evaluation unit just traveled to Europe, where the included AC plug adapters came in handy in different countries. This is a great product we all need, as USB power and charging becomes ubiquitous in our lives. Did you notice the low prices for all Arctic products? If you have difficulty buying them in your country, let us know and we will get updated purchase information from Arctic Cooling. The company rep tells MyMac: The ARCTIC SOUND S111 can be purchased through our international webshop. We are working on the US dealers and distributors. Hopefully, they will have stock in August. 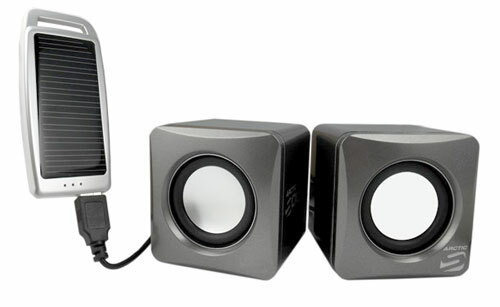 In addition to S111 USB speaker, we will expand our speakers product line further in the next couple months. MyMac Review Rating for all three Arctic Cooling products: strong 9 out of 10 recommendation.